Alex: It's been a while since I've posted a full board "best move?" problem from one of my games as a BQM, but I find the discussions that often ensue to be very beneficial, both to me, and to others. Today at the club, I was playing Huang Yong, who is about 4 dan. I feel that he's a bit stronger than me, but he's modest, so we play even with nigiri. This time I had White with 6.5 komi. Alex: I felt Black got a better start, but then he let himself get heavy on the top side. I think he expected me to let him bully my top left corner enough that he could escape into the centre, but I felt it could be neglected as long as my attack was in full swing. I had just exchanged the marked stones, but was unsure how to continue. I tried hitting the shape point with a, aiming at a cut, but of course he answered at the circled point; my supposed kikashi just ended up pushing him towards my own weakness. I don't know why it didn't occur to me. I'd like to hear some thoughts on where White should have played instead. I'll suggest b through e to get the discussion started, but everyone should feel free to propose their own moves if they see something better. I'd also be curious to hear what people think about the position in general; clearly White is behind in territory, but is quite thick on the right side, while Black's weak group is heavy. If both players handle this attack well, who will be ahead? 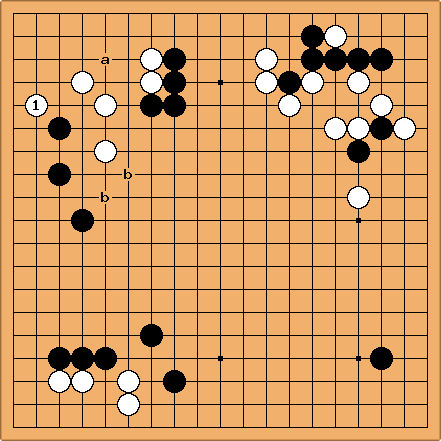 tderz IMO, whoever can first exchange the peeping kikashis for shape points (black oe white d) gets some small advantage (because the other one cannot play these points anymore effectively). I think of black , white f, Bg, Wh and cut black i (although one could hold everything after the initial black in reserve). Isn't + companion then very lonely? Charles Matthews The white position looks too thin for a successful attack. Right now I would be concerned, as White, about being thin in the centre; and also about Black at a. would be one way to deal with the centre. IanDavis Yes I thought White looked a bit weak to start attacking. In the original diagram playing at the circled point was my initial choice, but I also wondered if White could jump to b to stabilise before an attack - gross error? tderz: Forcing with (Bb, Wc, Bd) means stabilising black's moyo. At the same time becomes/remains black's forcing move for shape. Black resists - crazy idea? tderz: Perhaps W = now is the worst what white could do to black? Black reinforces with b and subsequently white likewise with c.
The eventual result is that the are weakened. Charles The real strategic question is the lower right: see /lower right. Alex: Alright, so let's rewind a bit. My error must have been earlier. Alex: Everything here looks normal enough to me. Maybe is questionable - it's hard to build a moyo with Black so low and solid in the top right, but I wasn't sure what else to do. Anyway, after - , it looks fairly promising to me. IanDavis: I found move 8 in combination with 6 questionable. Too gappy for my taste. Bill: - look thin to me. And I agree that it's hard for White to build a good moyo on the top. Maybe it's time to invade Black's moyo on the left. Alex: surprised me. I thought was much too painful for Black to allow. also seemed heavy, but I was kind of stuck for a reply. makes rather awkward shape. The natural move would be a of course, but I didn't want to make sente for him. He played it anyway. Should I have defended at a or b after all? Instead, I was worried about the cut at c, and came up with the sequence to to fix it in sente, at the expense of giving myself an open skirt by forcing . Andy: Between and - white has so much aji in the upper left corner that it seems to be white who lacks a base, not black. Accordingly, I like Dieter's suggestion below. When black reduces with , how about the usual at x rather than as in the game? Bill: and reveal White's problems with thinness. Also, I think that - is not a good exchange for White. Maybe is mochikomi. offers Black somewhere to run if necessary, and minimizes any profit White might make on top from attacking Black there. Black has to defend at . and seemed good to me, for keeping him separated from the left side and aiming at a reduction of his moyo, but should I have held back more? at a would be less thin, for instance, but wouldn't carry the threat of b. Normally I'm pretty good at finding my own mistakes, but I must have gone wrong before the move in the original diagram, and don't know where. kokiri it's not clear to me that the last few moves you make are coherent. playing , not a seems to be worrying more about the moyo on the left, and does seem to expose the thinness of the connection. To play , but then come back to play a defensive move to connect it seems almost unthinkable. On the other hand, to play a might encourage black to take profit on the bottom left, so i'm not really sure i like it. The conclusion I'd come to then, seems to be that playing maybe should be followed up by driving further into the moyo. As an alternative, how about 2 at c, more directly threatening the top stones, and allowing you to jump further into the black sphere of influence on the left if black defends? Bill: I suspect that the lower left corner was played out when the stones were in place. In that case, I think that would have been better at z. The left side is the focus, not the bottom side. Just for shape considerations I would like to sagari at y after , but that seems too passive. is ideal, so I think I would play instead of . I might even make a center moyo at some point. (Later.) Hmmm. has a problem with a Black peek at d. Not so good. Alex: You're right about the lower left, and yes, that's good advice. Alternately, maybe I should have made a second approach before invading the corner to try to force him to block the wrong way. Dieter: Using some basic concepts, I do not think that White is strong enough in the upper left to launch an attack with such a big stretch as the large knight's move. 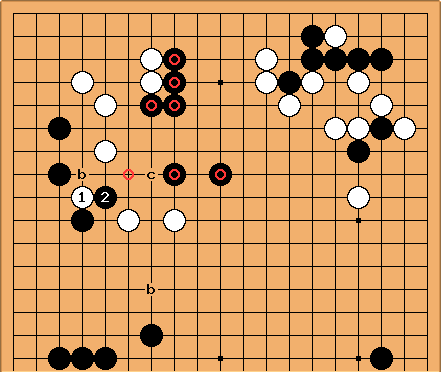 Moreover, Black is not exactlt weak either: he can exploit White's weak spot at a. White is strong, maybe even too strong in the upper right and needs some territory to match Black's. I would play to defend and make territory or b to defend with a one-space-jump/diagonal and threaten to erase Black's moyo OR attack Black's top. Alex: Of everything I've heard, I like this idea the best. Even with the weak point at a, White's territory is not small. Not enough to match Black's moyo, of course, but White's thickness on the right side is worth a lot (overconcentrated, I agree, but very thick). White also has komi. I think if here and Black defends his weak group, the game will be close. tderz: "Even with the weak point at a, White's territory is not small. " This statement is a misconception, I think. IMO, esp. due to the weakness at a the san-san d should at least yield in ko - once Black's -group is safe. I do not know now where to start first a or d.
For safety, at e could be considered (if that makes a difference). Alex: Okay, you're right. At first glance, I thought that the best Black could do after was to connect out with a stone at a. Now that I've read out all the variations (I think), it seems that Black can get a ko no matter what White does. So, how about at e instead? This page is so cluttered, I don't know where to put my diagrams, so how about I start BQM 225/Honte. tderz: After the exchange - , Black could continue with d or f, aways having white's weakness (Black g with 2 cutting points h and i) in mind. How could white prevent at least a connection to black k? both players should have in mind that atari a induces black b-c (which however also weakens the ). A prerequisite is that the are safe. If the corner was safe (e.g. Wa in place), here looks a little bit as an attack. tderz: strengthening the corner is perhaps a gote-no-sente type of good move? How dangerous is now the black warikomi-cut at f? Charles Interesting what attracts the attention. Is Black f White g ever going to be a problem for White? at d = , at k would be honte/good shape. At least it displays the thinness of that particular corner. tderz: No cut at f, black only reduced somewhat. tderz: Black e above is sente (due to the invasion a). tderz: above is not necessary, White loses in either case. Moves as =a do not work, White comes 1 liberty short.